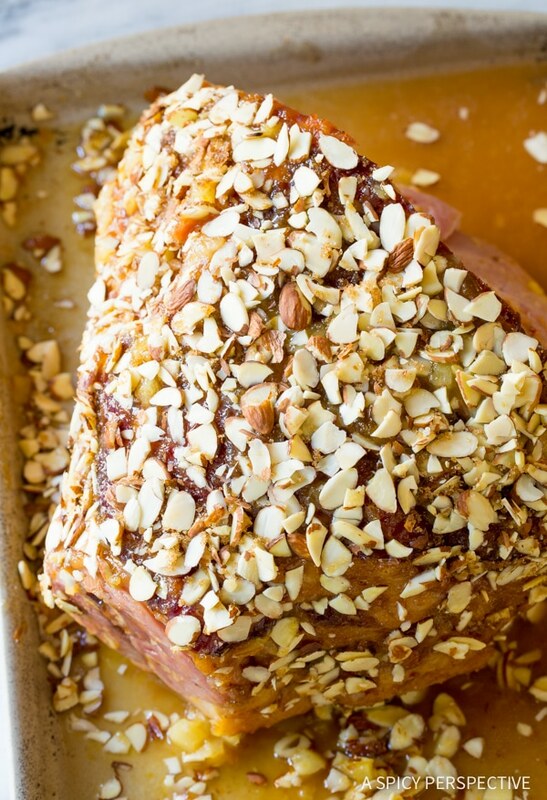 Simple yet dazzling Almond Crusted Baked Ham with Apricot Glaze, just in time for Easter! If I could keep a whole sliced ham in the refrigerator all year long, I would. We love pulling thick marbled slices off the bone, one at a time, for snacks and ham sandwiches. The only problem is my kids would eat rich succulent ham, and only ham, if they had the option to do so. I guess that’s why most of us bake a ham just once or twice a year, mainly around the holidays. Spring ham season is here, and I’m so glad it is! 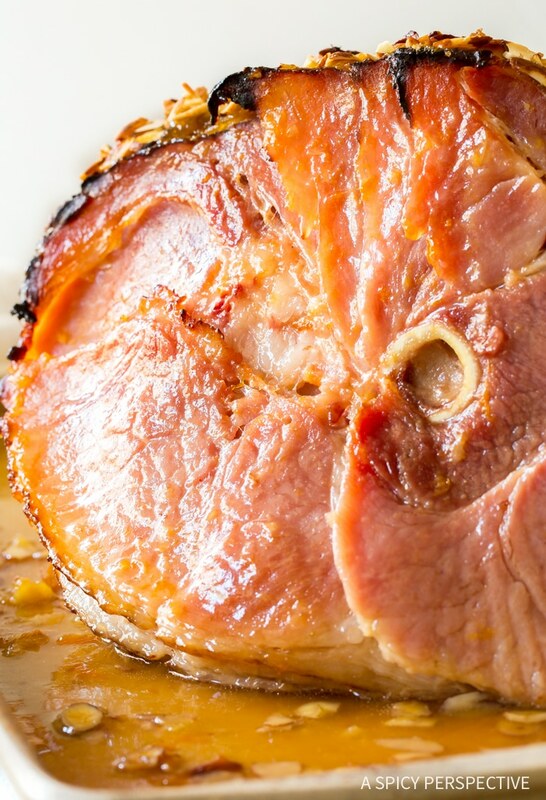 If there’s one thing everyone expects to see on our Easter table, it’s a juicy pearly-pink ham. This year I thought it would be fun to get away for the classic glaze packet that comes with the ham, and glaze my ham with something a little more exciting. 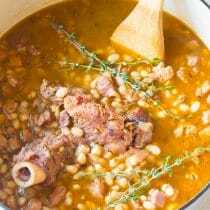 As I was shopping at ALDI last week, I discovered a few items that would make a wonderful sweet glaze to offset the richness of the pork. Plus, I found an assortment of big beautiful smoked hams, both sliced and unsliced, with the perfect amount of fat marbling. 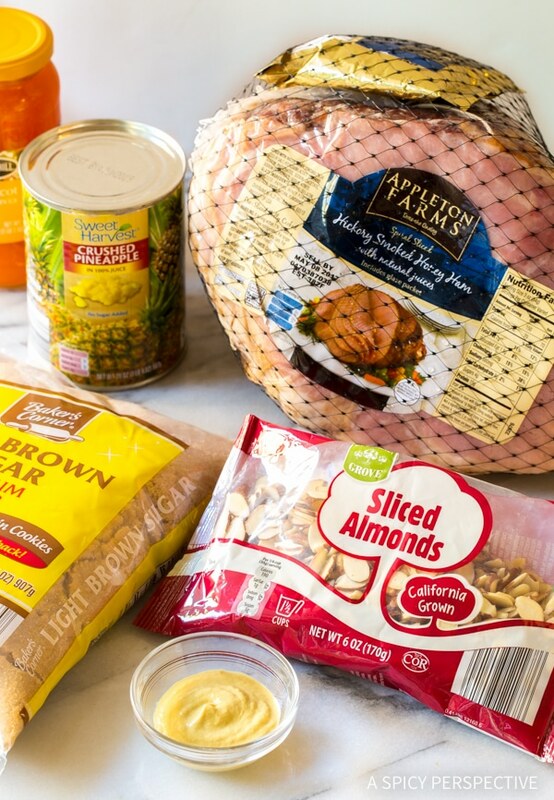 ALDI offers so many of my favorite ingredients at a significant discount. That means I can “experiment” to my hearts content, without breaking the bank! And oh how my family loved the extra ham lingering in the fridge. Actually I filled my grocery cart with all sorts of goodies, but only these six items were needed for a perfectly glazed ham. Today’s Almond Crusted Baked Ham with Apricot Glaze is the final product of my ham testing. I used apricot preserves, crushed pineapple, and dijon mustard to make a sweet and tangy glaze. I brushed it over the ham, separating some of the slices to let the glaze seep down into the ham. Then I baked the ham on low heat for a couple hours to warm the meat through the center. It’s important to remember that spiral cut hams are fully cooked. So you don’t want to bake a ham too hot or too long. You’ll dry out all the juicy goodness. After two hours I glazed the ham again, and pressed crushed sliced almonds and brown sugar over the surface, for a golden nutty finish. Then I popped the Almond Crusted Baked Ham with Apricot Glaze back in the oven to toast the almonds. 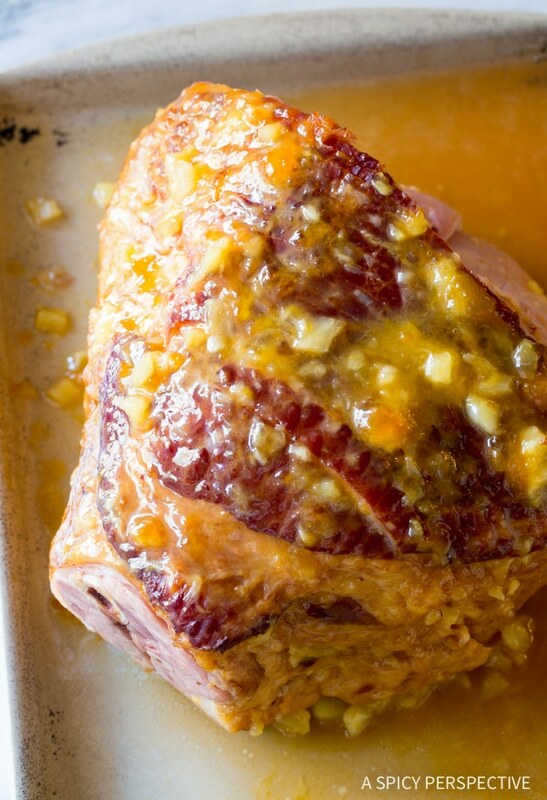 This simple and decadent Almond Crusted Baked Ham with Apricot Glaze is a perfect Easter ham recipe. 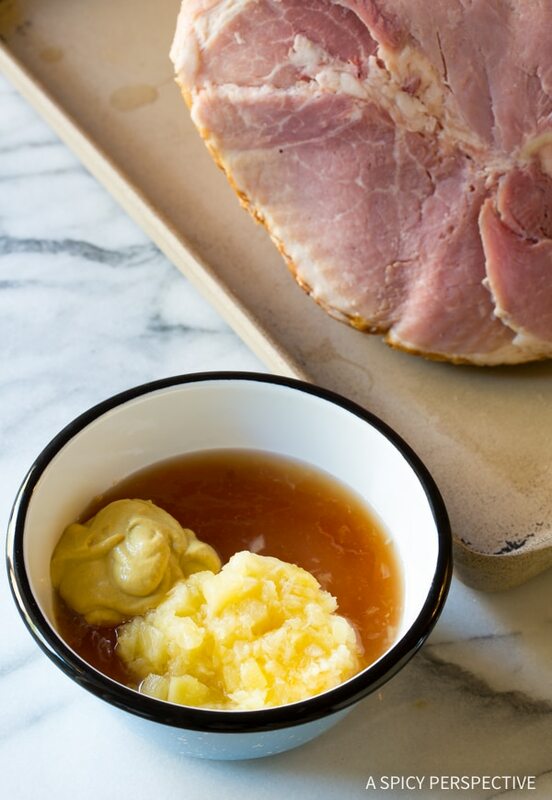 It’s dressed up enough to seem special, yet comfortingly savory-sweet just as a good ham should be. 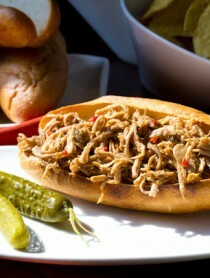 The apricot flavor and tangy crushed pineapple are a sensational contrast to the succulent pork. 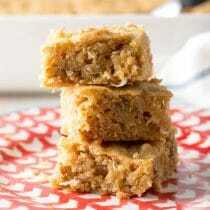 The little bits of toasted almonds around the edges of each slice, create a lovely textural variation. Make sure to spoon the drippings over the slices as you serve them for extra flavor! 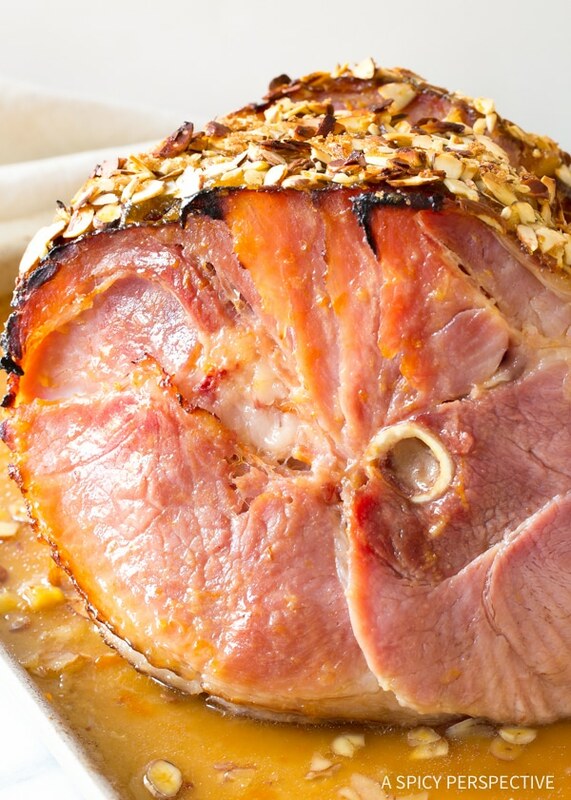 An Almond Crusted Baked Ham with Apricot Glaze makes a brilliant centerpiece for your Easter meal. Try serving it with Honey Butter Roasted Carrots, Sour Cream and Onion Deviled Eggs, Duchess Potatoes, amazing Macaroni Salad, Broccoli Salad, and creamy French Silk Pie! You can find all you need and more at your local ALDI store. You’ll save so much money on dinner, you’ll have extra to make sure your kids’ Easter baskets are overflowing this year! 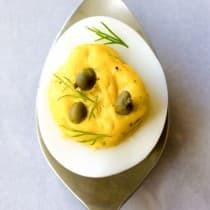 See all our Easter Recipes! 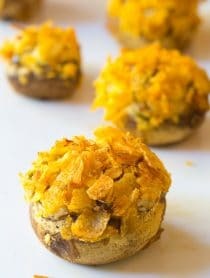 Almond Crusted Baked Ham with Apricot Glaze - A simple and amazing baked ham recipe with massive flavor and a crisp coating. Preheat the oven to 250 degrees F. Unwrap the ham and place it on a large rimmed baking sheet. Place the apricot preserves, crushed pineapple, and dijon mustard in a microwave safe bowl. 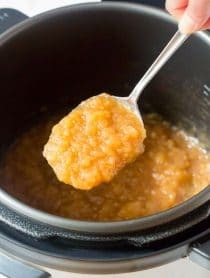 Warm in the microwave for 2-3 minutes, until the apricot preserves soften enough to mix evenly into the other ingredients. Stir well. Brush half the apricot glaze over the surface of the ham. Open and separate the slices here and there to let the glaze seep down between the layers as you brush it. Cover the ham with foil and place it in the oven for 2 hours. Meanwhile, roughly chop (or crumble) the sliced almonds into smaller pieces. (This helps them stick to the edges of each slice of ham.) Toss the almond pieces with the brown sugar. After 2 hours, remove the ham from the oven and raise the temperature to 400 degrees F. Brush the remaining glaze over the ham. Then press the almond and brown sugar mixture over the entire surface of the ham. Place it back in the oven for 30 minutes, uncovered, to allow the almond crust to brown. Serve warm. NOTE: All brand names mentioned in this recipe come from ALDI. Love the sound of this ham! 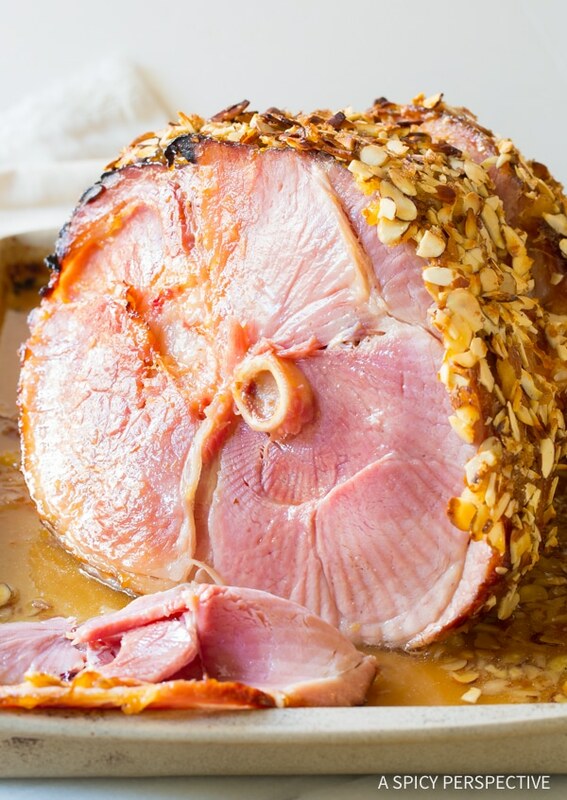 Love this take on a traditional Easter ham! 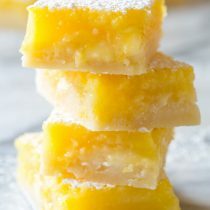 A great recipe for any holiday! I love Ham and rarely make it, but this looks so delicious I should! 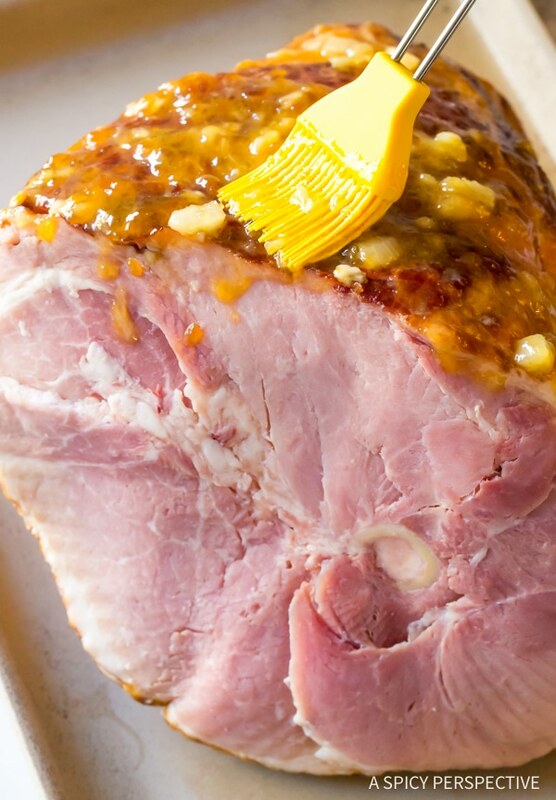 Drooling over this ham, and I don’t even like ham. Sure to be the show stopper at Easter.